Make sure to scroll to the right to see the entire table. During the initial Setup Wizard, you can create your printer's profile. Afterwards, you can create one or more printer profiles by visiting Settings -> Printer Profiles -> Add Profile... as necessary. Reply here with either screen captures of your printer profile in OctoPrint -> Settings -> Printer Profile or just provide the information from above for your printer. I'll do the rest by incorporating it into the table above. I typed it in the sequence of the list. Check my work to make sure that I've typed it in correctly. Neat. Initial setup could be done with "printer strings" that are easy to copy-and-paste, kinda like a condensed CSV. Just a thought. (next thought) or kept in a repository. Duh. @tedder42 Or a wiki, I suppose. I just didn't want to step on foosel's toes. ..and interesting to see foosel's Prusa MK3 settings; here's my custom bounding box, which I'm going to change to hers now. So is that 120 mm width, 120 mm depth and unknown height... or 120mm width and 120mm height? What's the variable name on the circular setup rather than width (radius)? @andypugh I think something got lost in translation from mail to forum here, only half of your settings made it. That's really wierd. They are all there in the version I sent. 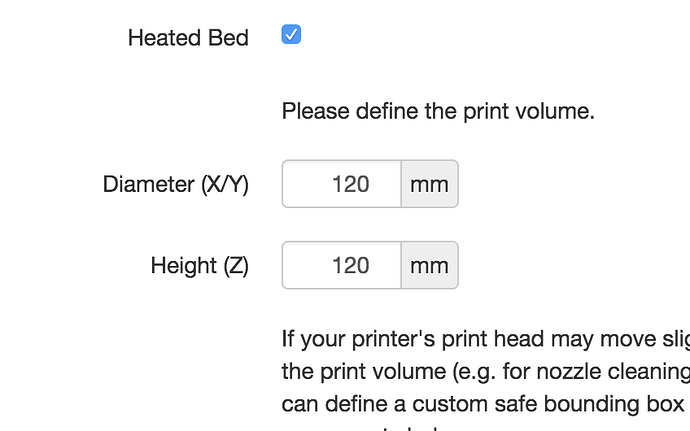 What's odd is that I set the printer profile for the stated specifications for the Robo C2 printer (300, 300, 6, 25) and it seemed like OctoPrint ignored them for a few weeks. And then just yesterday, the extrusion seemed to behave as if I'd blown out a stepper motor. I was so confident in this that I opened up a support ticket. In the meantime, I replaced the stepper motor with a smaller variety and it was also moving slowly. I put back the original, changed to the default OctoPrint profile settings of 6000/6000/200/300 and it's working perfectly again. Showing travel speeds in units of minutes rather than seconds? Is Octoprint using minutes everywhere? 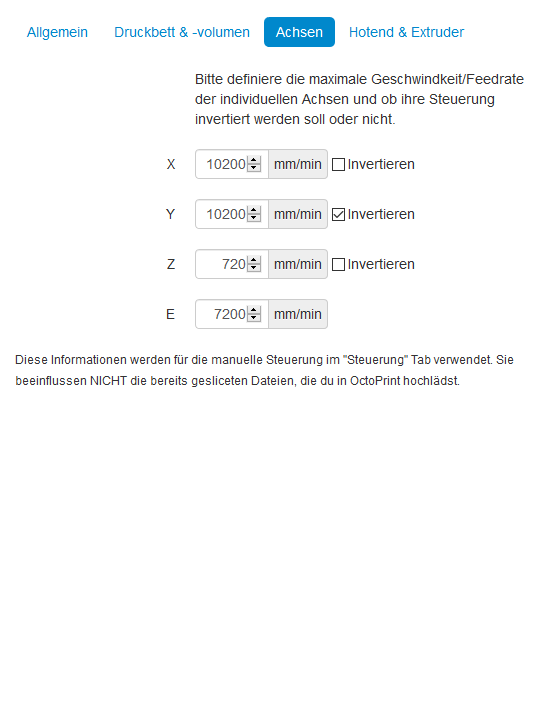 @skypuppy Apparently OctoPrint's profile screen uses mm/min as units in some of the feedrates. The wiki page for reprap seems to suggest that many of the rates are described in these units with some exceptions. My own firmware appears to be reporting back in mm/sec since it's a Marlin fork. I might do some testing but I'm guessing that the firmware is way off on its upper limit. I would guess that someone at Robo 3D screwed this one up, to be honest.